This lavishly illustrated volume offers a stunning new view of Yosemite's visual history by presenting two hundred works of art together with provocative essays that explore the rich intersections between art and nature in this incomparable Sierra Nevada wilderness. Integrating the work of Native peoples, it provides the first inclusive view of the artists who helped create an icon of the American wilderness by featuring painting, photography, basketry, and other artworks from both well-known and little-studied artists from the nineteenth century to the present. Yosemite: Art of an American Icon pursues several evocative themes, including the relationship between environment and aesthetics in Yosemite; the various ways in which artists have shaped how we see and use the park; and the dynamic intersections between art, nature, and commerce that have played out during its history. 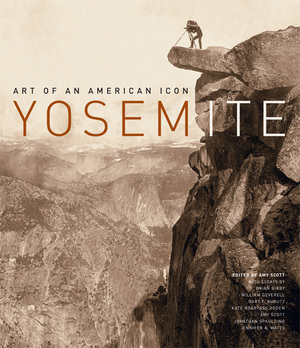 In addition to offering a wide-ranging view of Yosemite's art over the past two centuries, the volume provides intriguing insights into the complexities and contradictions inherent in its enduring image as both an unspoiled natural wonder and a must-see spot for sightseers. Amy Scott is Curator of Visual Arts at the Autry National Center's Museum of the American West, Los Angeles, California. William Deverell is Director of the Huntington-USC Institute on California and the West. Kate Nearpass Ogden is Associate Professor of Art History at the Richard Stockton College of New Jersey. Gary Kurutz is Curator of Special Collections at the California State Library. Brian Bibby is an independent scholar and author. Jennifer Watts is curator of photography at the Huntington Library. Jonathan Spaulding is executive director and chief curator at the Autry National Center's Museum of the American West.